I don’t know about you, but I can find men incredibly difficult to buy for! Something that always remains a great find though are socks! They ALWAYS need them and my other half seems to have a drawer filled with holey socks (do they ever throw them away?!) Now as lovely as it is to give your guys new socks, this is Bespoke Bride after all and you know how we love to put personal spins on the normal gifts! This is why Cute n Crafty offer the perfect products for gifting your grooms or groomsmen! Not only do they offer beautiful & comfortable socks but they create these fun & quirky labels that wrap around them! The labels range from fun quotes about your groom getting cold feet to asking your guys to be groomsmen and there are even thank you labels to give them after the wedding! How awesome is that?! Cute n Crafty have even been kind enough to offer you lovely readers a free printable of one of these labels! ‘True love is like a pair of socks. They’ve got to match and you’ve got to have two. I’m so happy that I’ve got you!’ can be downloaded right here! Of course you don’t have to use this printable, you can head on over to Cute n Crafty yourself and buy beautiful socks and fun labels to your hearts content! 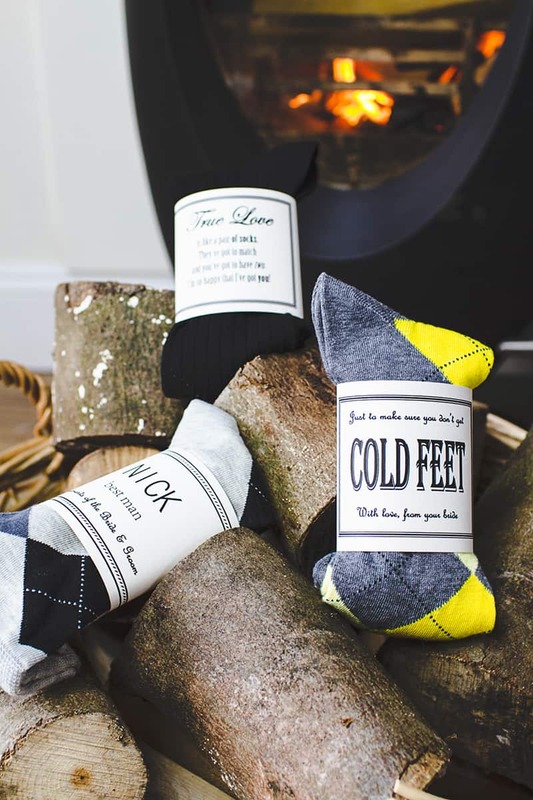 These socks would also make awesome Christmas presents for the men in your family and with the cold season fast approaching you’ll want to keep their feet warm for the chilly months ahead! Oh and did I mention Cute n Crafty also do mugs, gift boxes and instant downloadable cards, champagne labels & artwork?! That’s right my friend, they really are a perfect way to personalise your gifts for your wedding! Don’t forget, you can also keep up to date with any new products or sales over on their Facebook Page! Happy shopping!